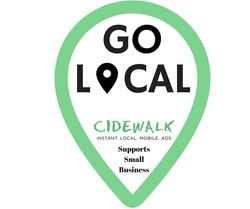 Our new ads remind people that you are a local business owner that directly impacts their community. They highlight your hometown and remind people that they should support you over corporate chains. ​We know you've worked hard preparing for Small Business Saturday - so we don't want you to miss out on the deals. As a sign of our support, take this 20% gift. ​Use coupon code GOLOCAL from now until Small Business Saturday at checkout to receive 20% off your subscription after your trial period has ended.